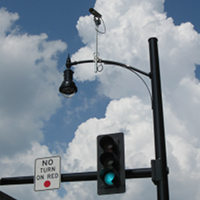 My current research focuses on real-time adaptive traffic signal control for urban road networks. We have completed a pilot test of SURTRAC (Scalable Urban Traffic Control), our adaptive signal system on nine intersections in the East Liberty commercial district of Pittsburgh, Pennsylvania. Traffic signals controlled by SURTRAC respond in real-time to shifts in traffic conditions, reducing congestion and vehicle emissions. We are currently expanding the pilot site to nine additional intersections around Bakery Square, we'll be expanding to 29 more intersections in Pittsburgh by next fall, and we're currently planning a deployment outside of Pittsburgh. Many real-world problems are dynamic in some way and require adaptation over time. While we can treat dynamic problems as a series of static problems, many problems change too fast for this to be possible. Often, the dynamic nature of problems has some structure, which can be exploited to improve performance. The use of memory in dynamic optimization is one way to exploit structure in dynamic problems. My thesis research investigated ways to improve memory for dynamic problems. I have developed two novel classes of memory: density-estimate memory and classifier-based memory. Density-estimate memory builds probabilistic models of good solutions discovered during the search process, allowing the memory to create a rich, long-term model of the dynamic search space. Classifier-based memory introduces an abstraction layer into explicit memories to allow memory to be used for problems like dynamic rescheduling, where a stored solution becomes obsolete as tasks are completed. While most work in evolutionary robotics has been on wheeled mobile robots, unmanned aerial vehicles (UAVs) present a real opportunity for evolved control. In my master's thesis, I investigated the evolution of navigation controllers for UAVs. In subsequent work, I have done robustness testing for UAV controllers evolved in simulation in order to select a controller for transference to a real UAV. I have also evolved multi-UAV teams for distributed tasks. While I was at the Center for Robotics and Intelligent Machines at NC State, I also worked on evolutionary robotics for wheeled mobile robots. 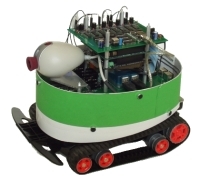 For this research, we used the EvBot and EvBot II platforms developed in-house. Much of this work was done with Andrew Nelson on his Ph.D research on evolved neural controllers for robot colonies. I also evolved genetic programming controllers for a radar tracking task (originally intended for UAVs) and transferred the controllers to the EvBot II platform. 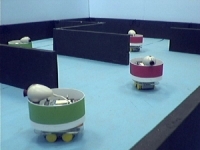 A passive sonar system on the robot was used in place of the radar sensor, and a speaker emitting a tone was used as the target in place of a radar. The EvBot research platform was developed at the Center for Robotics and Intelligent Machines at NC State. John Galeotti developed both the hardware and software for the first EvBot, and Leonardo Mattos developed the hardware for the EvBot II. While I was an undergraduate, I developed the upgraded software for the EvBot II, developed a communications protocol for the robot colony, and helped to automate many of the robot experiments we were doing at the time. In addition to the evolutionary robotics work we did using the EvBot colony, we also used the colony for experiments on leadership protocols for distributed sensor networks.